Recently diagnosed With Prostate Cancer? Want to Talk with other suffers? You are not alone - we can help! NEWS LINKS: Link here to our News & Leaflets page for events we support. Susan Drew is from Prostate Cancer UK. What are PSA, Gleason scores, T1,T2,T3,T4, M & N? Confused by all the jargon? Have a look at this introductory leaflet by Prostate Cancer UK. Click here to see the article. The Reading Prostate Cancer Support Group provides support for men suffering from prostate cancer, and for their wives and partners. We achieve this by offering information, support, help, and a social setting in which group members can converse at regular group meetings and social functions. The information that we - the RPCSG - have is based on the experiences and treatments of other members, but you should of course see a consultant for treatment specific to you. We cannot offer medical advice. We hold regular meetings and social functions, and events to promote awareness of prostate cancer in the community. We work closely with staff at the Royal Berkshire Hospital in Reading. Many of our members first attend a meeting after diagnosis and before treatment, and found advice and experience very helpful in this confusing time before treatment. We warmly welcome new members - Please note that Membership is FREE - and their partners, who are invited to either attend one of the monthly meetings, or to contact a support member on the telephone numbers found on the Contacts/Support page. We arrange several events during each year, and hold monthly group meetings, at which we have professional guest speakers who give presentations on topics relevant to prostate cancer. These meetings also give the opportunity of social interaction between members. A regular Newsletter is sent to members. 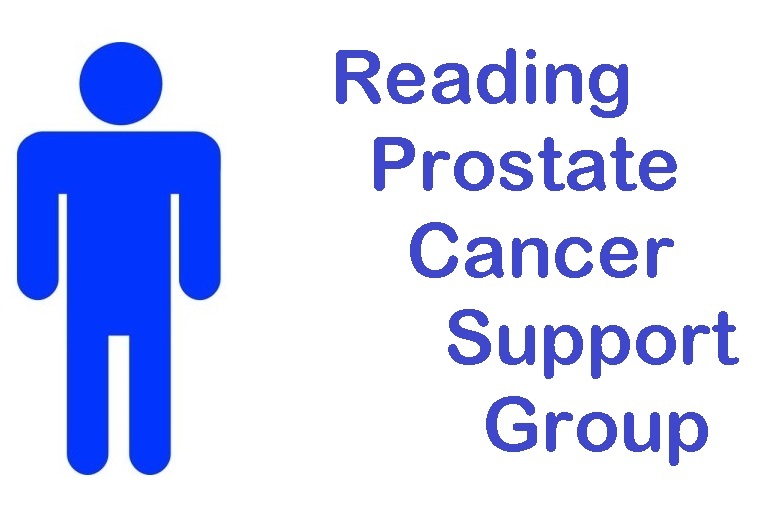 The Reading Prostate Cancer Support Group has been running since 2007 and has a membership of more than 120 male and female members, many of whom attend our meetings - often with their family. Our meetings are held in the early evening on the first Friday every month. The Committee work to ensure that we have the chance to hear presentations by well-respected professionals on topics of interest to the group. Meetings are held next door to the Royal Berkshire Hospital, just a short walk for those receiving and providing treatment. Hence we attract many of the top professionals in Berkshire, some may even be treating you. In addition we make a point of inviting speakers from around the country together with specialist nursing professionals who often take a lead to get things known and shared. Finally we take time to find where new treatments are heading so progress can be understood in layman's terms and the news shared by all as diagnosis and treatment awareness of prostate cancer continue to improve. Please note that by clicking on bold/underlined text you can link other pages on this website or to external websites - often with their own maps. Links to external websites should open a fresh 'window' in your internet browser.